Any respectable image editing application allows you to resize images. However, this is just one of the many features they offer and may not be the most efficient solution if you need to resize photos often. rEASYze is a small and portable tool that enables you to easily resize images. 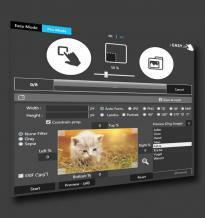 It comes with a sleek, dark interface and provides support for batch resizing images. Furthermore, you can use it to apply watermarks on your photos, as well as customize their looks with filters and convert them to a different format.